A veneer is a thin layer of porcelain or composite that fits over the front of a tooth (a little like a false nail over a fingernail). A veneer usually requires two appointments. At the first appointment, after your dentist has removed some of the tooth, an impression (mould) of the tooth will be taken and sent to a laboratory where a dental technician will make the veneer. At the second appointment, your dentist will glue the veneer onto your tooth with a strong adhesive, to hold it firmly onto the tooth. 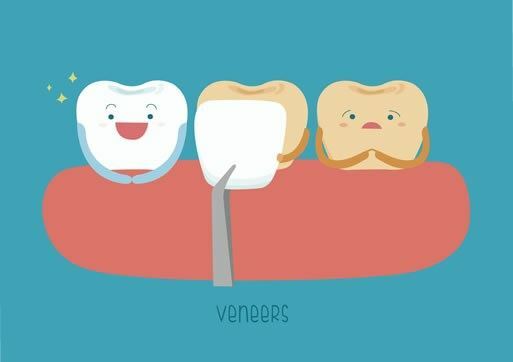 Veneers are very thin and are held in place with a strong glue which often means very little tooth needs to be removed before fitting the veneer. It can be very difficult to match one veneer to the surrounding teeth. This is something that can be discussed with us before treatment. It is best to come and have a chat with the dental team to find out whether your teeth are suitable for veneers.